For more info and a programme click here. Engineers may not always be known for being romantically inclined, though three of their number – who also happen to be talented musicians – will be challenging that stereotype. Paul Roberton (piano), Jennie Khan (cello) and Chloe Irwin Whitney (Mezzo-Soprano) will perform an afternoon concert of romantic music entitled Second Love at Alberton on 30 June at 2pm, sharing their love of music over a glass of wine with concert-goers. 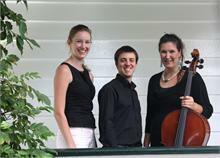 Photo: (l-r): Mezzo-Soprano Chloe Irwin Whitney, pianist Paul Roberton and cellist Jennie Khan. Auckland classical singers and musicians will come together to perform a special concert of music for mothers at Alberton, including pieces written by mothers, about mothers, and featuring a selection of mothers’ favorites. “The programme has something for everyone, from earliest times to today, and includes young singers as well as musicians playing the harp, cello and piano,” says Alberton's Manager, Rendell McIntosh. The concert's on Sunday 12 May at 4pm. Bookings essential – admission ust $25 per person. To book phone (09) 479 2361 or email cathieharrop@ihug.co.nz. People wanting to learn more about archaeology of the upper half of the North Island can attend public talks in Northland, Thames-Coromandel and the Bay of Plenty throughout May. Presented by the NZHPT’s regional archaeologists – with occasional guest speakers - the NZHPT's Introduction to NZ Archaeology involves a fascinating insight into the role of the NZHPT in New Zealand archaeology, incorporating local history and archaeological examples. Contact sgraham@historic.org.nz or phone (09) 407 0470. Whangarei: Whangarei Library (May Bain Room), May 8, 6pm. Kaikohe: Kaikohe Memorial Hall (Banquet Room), May 14, 6pm. Coromandel: St John’s Hall, May 21, 12 noon. Contact aphillips@historic.org.nz or phone (09) 307 9920. Whitianga: Mercury Bay Library, May 21, 6pm. Cachaca Duo were very popular last time they played at Highwic, so bring your mother along to this great concert of bossanova, tango, milonga, bolero and latin jazz. Belinda Carrigan has post graduate qualifications in violin performance from the Royal Northern College of Music in Manchester. She has many years of experience as a performer. Johannes Dimyadi has been playing the violão (nylon-string guitar) since the age of 15. The multi-ethnic influences of his early years can be traced back to some Portuguese elements found in Indonesian culture and music. He combines folk and classical approach in a unique fingerstyle guitar playing. Can earthquake prone masonry buildings be strengthened? Yes they can! A presentation on seismic strenthening buildings by earthquake engineering expert Win Clark. The NZHPT promoted 12 of its key heritage tourism destinations recently at the country’s biggest annual international tourism showcase. TRENZ – the four-day tourism expo held on Auckland’s Queen’s Wharf – drew over 1000 international and New Zealand delegates, including 290 international buyers. “TRENZ offered the NZHPT the perfect opportunity to promote its unique suite of properties throughout the country to some of the most strategic overseas buyers of tourism products in one place at any one time,” says Jan Titus, who managed the NZHPT’s presence at the show. As well as its portfolio of premier properties ranging from the Kerikeri Mission Station in Northland through to Totara Estate near Oamaru, the NZHPT also promoted two new tourism products at TRENZ – the new Honey House Café at Kemp House, and the Waikato War Driving Tour, which engages the latest digital technology to take visitors on a driving tour of sites related to the Waikato War of 1863-64. “The feedback we had from the people we met with was overwhelmingly positive, and there was a very high level of interest in our products,” she says. Photo: Prime Minister and Minister of Tourism, John Key, at the NZHPT stand at TRENZ with the NZHPT’s Northern Heritage Destinations Manager Natalie McCondach. New Zealand’s historic buildings can be made safe in a way that maintains their heritage integrity and the important stories they tell us about who we are. That was the NZHPT's message at the third annual Safe Buildings Conference, held last month in Wellington. The conference, which was supported by the NZHPT and the New Zealand Building Industry Federation, provided a forum for industry to learn, examine and debate the issues surrounding how new standards of safety can be achieved. The NZHPT was represented by Senior Heritage Policy Adviser Robert McClean and Heritage Adviser Architecture Alison Dangerfield. Alison says there are very few buildings that can’t be turned around by some well-directed care. Robert says the conference, and other similar events around the country, provide an excellent opportunity for the NZHPT to share its expertise in areas such as adaptive use. Photo: Alison Dangerfield says Wellington's St Andrew's on the Terrace is a good example of a beautifully maintained and restrengthened building – taking full account of its heritage. Otago archaeologist and heritage advocate Dr Jill Hamel has been named the recipient of the 2013 Dunedin Heritage Festival Bluestone Award. The award was presented in Dunedin last month at the NZHPT's annual R.A. Lawson lecture, as part of the Dunedin Heritage Festival. The award, sponsored by the NZHPT, recognises the outstanding contribution of an individual, business or organisation to the promotion and preservation of Dunedin’s heritage. Owen Graham, NZHPT Otago/Southland Area Manager, says the selection of Dr Hamel was consistent with the spirit and intent of the award, which was established in 2009. In presenting the Bluestone Award, prominent New Zealand architect Ian Athfield highlighted some of Dr Hamel’s significant achievements, including her long involvement with Otago high country pastoral leases as a contract archaeologist and historian for the Department of Conservation. This work pioneered the heritage assessment on pastoral properties across Otago and Southland. Dr Hamel was also the driving force behind efforts promoting the protection, retention and upgrading of the 37.5km of historic seawalls encircling the Otago Harbour. She pioneered the construction design technique now used for all seawall work. Originally qualified as a botanist and zoologist, Dr Hamel began her studies in archaeology in 1966 and completed her PhD in 1977. Her extensive field based historic and archaeological surveying and authoritative reports (more than 175 published and un-published works) have contributed immensely to the knowledge and understanding of early Dunedin, Otago and New Zealand. Her 2001 publication The Archaeology of Otago has become a standard field guide for the region. Dr Hamel last month also received a Certificate of Meritorious Service from the NZHPT in recognition of her contribution to New Zealand archaeology and historic heritage and long standing association with NZHPT as a member since 1976, including as Chairperson of the Otago Regional Committee from 1981 until 1984. Cantabrians have long been proud of the region’s education heritage, but they had extra reason to pay respect to the city’s remaining historic educational treasures last month, as New Zealand and the world celebrated 2013 International Day for Monuments and Sites. Thursday 18 April marked the day, which is convened by the International Council for Monuments and Sites (ICOMOS), and this year focused its attention on the heritage of education. The day is also sometimes referred to as world heritage day. The day took on extra meaning in Christchurch, which has a strong identification with its educational institutions, and is still recovering from the loss of much of its heritage after recent earthquakes. New Zealand Historic Places (NZHPT) Southern Region General Manger Rob Hall says it’s more important than ever to celebrate the city’s remaining heritage. “Despite recent events in Christchurch and the loss of so many of our heritage buildings a good number of the city’s original educational buildings have survived. “From Cranmer Square in the north to St Michael's Church School (the city’s oldest school) on Oxford Terrace in the south, there remains a small precinct of Christchurch’s early educational buildings, which unless pointed out could be easily overlooked,” says Mr Hall. Heritage consultant and chair of ICOMOS New Zealand Jenny May agrees. “We do tend to forget about our educational buildings. But it is so unusual to have such a concentration of our colonial beginnings in one small area and they tell us so much about our social history,” she says. Some of the city’s foremost and celebrated colonial architects designed these institutional buildings: William Armson, Thomas Cane, Collins and Harman, Benjamin Mountfort, George Penlington, Samuel Hurst Seagar and Cecil Wood. The precinct included the Peterborough Centre which opened in 1930 as the Christchurch Teachers' College and in 1986 was converted into award winning luxury apartments; the Christchurch Normal School, later Cranmer Court, which housed New Zealand's first teachers' training college (1876); Cathedral Grammar (1863); Christ’s College (begun 1863); the Arts Centre (began 1876); the second Christchurch Girls’ High School, identified for over 100 years with the development of women's education in New Zealand; the Canterbury Museum (1870-1877) and the Curator’s House, built in 1920. Although some of these buildings have been lost, they were a significant part of the city’s architectural as well as social heritage. “They were very much built on what we would call Collegiate Gothic design with that institutional design in mind. They were recognisable institutions that said what they were and you treated them with respect,” says Jenny May. To mark world heritage day, the NZHPT and ICOMOS New Zealand conducted two NZHPT members guided tours around the built heritage of Christchurch’s educational facilities on the western fringe of the inner city. More information about New Zealand’s educational heritage can be found online by visiting the NZHPT’s Register of historic places. Photo: Statue of William Rolleston outside the Canterbury Museum. Rolleston was instrumental in the establishment of the Canterbury Museum and the Canterbury College, which now houses the Arts Centre. The Heritage of Education was also recognised in the far North on 18 April. And according to NZHPT Northland Area Manager Bill Edwards, Northland has a lot to celebrate. “Some of New Zealand’s earliest educational activities took place in Northland, mainly spearheaded by missionaries representing different denominations including Wesleyan, Roman Catholic and Anglican,” says Bill. Other early educational activity took place in buildings that are now cared for by the NZ Historic Places Trust – including Kemp House in Kerikeri, where missionaries educated the sons and daughters of rangatira, including Rongo, the daughter of Hongi Hika, and Hone Heke whom she later married. But it was perhaps at Te Waimate Mission in Waimate North, where education in New Zealand received a major push when Bishop George Selwyn established the grandly named St John’s College there. The College was very much a reflection of Selwyn’s own educational experiences at Eton and Cambridge – even naming two of the buildings at the mission ‘Eton’ and ‘Magdalen Hall’. The purpose of the college was to provide education for ordinands and candidates for Holy Orders; the Collegiate school for the sons of missionaries and other Pakeha; the Native Teachers’ School for the training of Maori teachers and preachers; the Native Boys’ School for Maori boys, and an infant school – all with some success. “It was really quite an extraordinary time in the history of education in New Zealand – though sadly, perhaps, short-lived,” says Bill. Archaeological features from this time are still visible today, and serve as tangible reminders of this extraordinary period of time in the history of the mission at Waimate North – and education in New Zealand. According to Jenny May, the Chair of ICOMOS New Zealand, the International Day for Monuments and Sites seeks to encourage local communities and individuals around the world to consider the importance of cultural heritage to their lives, identities and communities. “Education in New Zealand was practised in a wide range of places – and particularly so in Northland. Many of the buildings and sites associated with early education initiatives are a significant part of our cultural heritage,” she says. Over 80 people attended a special heritage film screening at the Film Archive in Wellington last month, in an event to recognise International Day for Monuments and Buildings (world heritage day). The films covered the construction of the former T&G building (Harcourts) in Wellington in 1928, the New Zealand Centennial Exhibition which ran from November 1939 until May 1940 in Wellington, and the changing face of Wellington City buildings in the boom period of the early 1980s. The NZHPT sponsored the film evening with support from the Wellington City Council, the Museum of Wellington City and Sea and the New Zealand Film Archive. In other events in the Central region, an action packed heritage programme with a harvest theme gave Nelsonians and their visitors plenty to do during Nelson Heritage Week (13-21 April). Highlights included an open day to South St, considered to be one of New Zealand’s oldest streets, and Elliot St celebrated 100 years as a street and 20 years as a heritage precinct. Awards were also presented to local heritage heroes by Mayor Aldo Miccio and NZHPT General Manager Central, Ann Neill. These awards celebrated those people who are working hard to preserve the built heritage of the city and have been recipients of council’s heritage incentive grants. 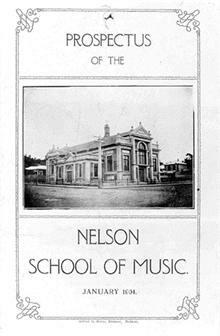 Among these heroes were Alexsandra Mark for the restoration of Fellworth House (Category 2), and Nelson School of Music (Category 1) where a major redevelopment is envisaged. People interested in learning more about the archaeological features of Whakatane and Ohope are in for a treat. Awakeri-based archaeologist Lynda Walter will present a public lecture and lead a field trip looking at some of the district’s extraordinary archaeological features as part of a series of public archaeological talks being organised by the NZHPT. First up will be Lynda’s public lecture entitled What’s Under Our Town? The Archaeology of Whakatane on 9 May, 7pm at the Lyceum Club (58 Domain Rd, Whakatane). “Over the past 15 years, significant information has been uncovered about the early occupation of Whakatane township,” says Lynda. “I’m looking forward to bringing together some of this information and sharing it with people, who I’m sure will look at Whakatane with new eyes after the talk,” she says. Lynda will be joined by the NZHPT's Lower Northern Archaeologist, Rachel Darmody, who will also deliver a brief presentation on the NZHPT’s role with archaeology in New Zealand. “This is going to be a great talk with a lot of fascinating information about Whakatane’s archaeological past,” says Rachel. And for people wanting to explore one of the eastern Bay of Plenty’s larger pa, Lynda Walter will also lead a guided tour of the Tauwhare Pa Scenic Reserve on 18 May. “The Tauwhare Pa reserve contains a complex of three pa on a low headland jutting into Ohiwa Harbour. The land around the harbour was heavily populated in prehistory due to its favourable climate, soils and access to abundant seafood,” says Lynda. What’s Under Our Town? The Archaeology of Whakatane takes place at the Lyceum Club on 9 May at 7pm. Admission free, though bookings are recommended – contact the NZHPT’s Tauranga office on Ph (07) 5774530 or email jhetherington@historic.org.nz. The Tauwhare Pa Field Trip takes place on 18 May at 10am. Old St Paul's will soon be opening its doors for seated dinner functions. Old St Paul's Manager Silke Bieda says the idea was born when the church hosted a small thank you dinner for a group of funders last year. "NZHPT staff and guests enjoyed the special set up immensely. Long after the event participants kept referring to the evening as a truly unique dinner experience in Wellington’s most stunning historic building." Silke says she always knew Old St Paul's was a versatile event venue, but there had been concerns about space for some functions. "Under survey of our conservation architect Russell Murray we have now found a way of spinning and shifting some of the pews to accommodate seated dinner functions." She says it has taken a while to come up with the right balance of offering a unique function venue without impacting on the heritage fabric of the building. "A lot of thinking, trialling and preparing has gone into it but we are now able to offer wedding receptions for up to 120 guests and corporate function galas for up to 180 people." Photo: Old Saint Paul's could soon be a venue for wedding receptions - as well as ceremonies. The work of the NZHPT’s Hauraki Branch Committee was acknowledged recently at a special luncheon marking the formal winding up of the committee. NZHPT Northern Board Member, Allan Matson, paid tribute to the work of the committee over the years, and presented members with certificates of Merit and Meritorious Service on behalf of the Board. Sue Wright, the Chair of the Committee, was commended in particular for her work on a series of heritage trail brochures for Thames, Grahamstown, Coromandel, Tararu and the Shortland area of Thames, as well as her tireless work organising heritage cruises of the Hauraki Gulf which have been enjoyed by hundreds of people over the years. Sue was awarded a Certificate of Meritorious Service, along with other committee members Bob and Robin Irvine (who produced a heritage trail brochure for Waihi and Paeroa) and Treasurer Alan Berry, acknowledging their long-standing service to the committee. The NZHPT’s General Manager Northern, Sherry Reynolds, also paid tribute to the work of the committee over the years. Photo: (l-r, back row: Diane Connors, Sherry Reynolds of the NZHPT, Mary Carmine, Allan Matson; l-r, middle row: Warwick Buckman, Allan Berry, Bob Irvine, John O’Hare of the NZHPT. Front row, l-r: Robin Irvine, Sue Wright, Graham Smith.